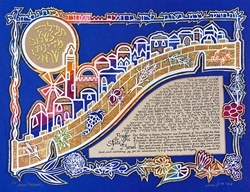 Tefilla L'Shlom HaMedina - The Prayer for the State of Israel design (also available with the text of the Prayer for Those who Dwell in the Land of Israel) expresses the richness of the Holy Land and the hope it represents through its bold colors, its seven special fruits and flowers and its Jerusalem of Gold. 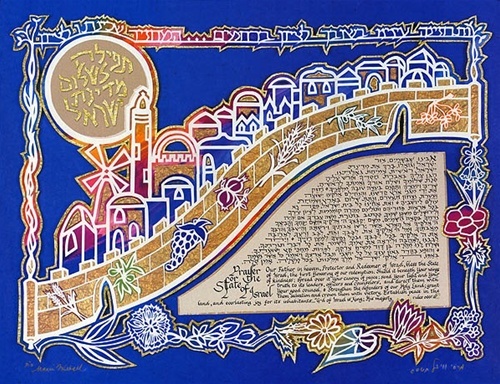 Connecting all the parts is the Torah, which illuminates the world and stimulates the constant growth of the Jewish nation. Our Father in heaven, Protector and Redeemer of Israel, bless the State of Israel, the first flowering of our redemption. Shield it beneath Your wings of kindness; spread over it Your canopy of peace; send Your light and Your truth to its leaders, officers and counselors, and direct them with Your good counsel. Strengthen the defenders of our Holy Land; grant them salvation and crown them with victory. Establish peace in the land, and everlasting joy for its inhabitants... G-d of Israel is King; His majesty rules over all."